Chaos Intellect and Time & Chaos offer excellent contact management with tasks and appointments, on Windows PCs. You can easily expand your use of your Chaos Data files, however, to include using your data with popular Apple devices running iOS, including your iPhone or iPad. 1) Best Choice: add a ChaosHost.com account for your data! Sync your data Over-The-Air to the built-in apps on your device! iPhones and iPads feature built-in applications for Contacts and Calendar data. Newer versions also include a Reminders program for Tasks data. By having a ChaosHost account, you'll be able to use a built-in way on your iPhone or iPad to sync with ChaosHost, just like our desktop software does. Add a new account to your device the same way you would add an new email account, but by using a special "Exchange" account, you'll see options for your device to sync Contacts, Calendars and Reminders. This data is sent from ChaosHost.com directly to your device through the Internet. You won't have to use a wire or connect your device to a computer at all to get this data! Your iPhone/iPad is also able to keep synchronizing over the air as you use the Contacts, Calendar or Reminders apps on your iPhone, so any changes you make while mobile will get copied back to ChaosHost.com. When you return back to your computer where Intellect is installed, our desktop software can sync with ChaosHost to pull those changes down to our software on your PC, too! We have released a few native apps written specifically for iPhone which sync with ChaosHost to get your data back and forth between your iPhone and your PC. They offer some capabilities in areas where the normal apps from Apple or from others in the App Store don't quite match what our Windows software can do. The current apps available now are Chaos Tasks and Chaos Billing (a match for our Legal Billing software). They can be downloaded now from the App Store. Click here for details! One other benefit of a ChaosHost account is that in addition to hosting and synchronizing data, we also have a web application that allows you to work with your data through a web browser when you are away from your PC. 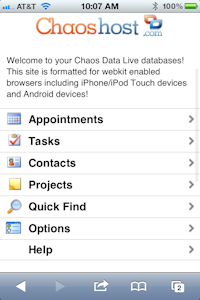 Either as a supplement to doing the Over-The-Air Sync or as a separate option, ChaosHost offers a special mobile version of the Chaos Data Live web application that is designed for use on iOS device's Safari browser. When you login to ChaosHost's mobile edition, you can see your data, make changes and additions, all at a form factor appropriate for handheld devices. When you get back to your PC, you can use the Web Synchronization option in our PC software to make sure your changes made online are transferred back down to your computer. This web app is especially useful because it allows you to work with your Memos or Projects data, which otherwise would not be available to your device, since iOS devices do not have built-in applications and Exchange synchronizing that supports our Projects data. Safari even lets you put specialized desktop icons right on your device's home page so it can be launched just like any other app you purchased from the App Store! The special mobile version of ChaosHost formatted for iPhone and other mobile phones can be found at https://www.chaoshost.com/m/ and you can use the special icons by bookmarking any section of our site and choosing to add it to your main screen. How do I get a ChaosHost account and how does it work with my current software? If you don't already use ChaosHost.com, our sales department can set you up with a free, fully functional, 30 day trial so you can see the sync process first hand before purchasing a ChaosHost subscription. You won't need to hold it with a credit card either! If it doesn't work for you they way you want, it will expire on its own without any need to cancel. You'll only need to do something if you want to keep it! Once you have an account, your data can be synchronized with Chaos products using an option you will find is already built-in to your desktop softare, on the File Menu, under Web Synchronization. Fill out your user name and password and it is ready to go. You can sync your pc on demand or sync automatically when you start and/or exit our program, your choice. Keep in mind that unlike many "cloud" solutions, you are NOT giving up your PC. Intellect and Time & Chaos will continue to keep a local copy of your data with all the features you have gotten used to using. But, now you'll be able to work in more places by using ChaosHost to keep your phone in sync or to use the web site version from any borrowed computer! Once your ChaosHost account is up and running, you can find the full step-by-step details on adding the new ChaosHost account to your iOS device in the ChaosHost help files. If, for whatever reason, we can't interest you in an account at ChaosHost.com, one alternative takes advantage of the relationship between iTunes and Microsoft Outlook. Apple has built-in support in iTunes to grab Contact and Calendar data from the Microsoft Outlook program installed on the same PC as iTunes. If you have both iTunes and Microsoft Outlook, you can purchase an add-on tool for Intellect called ChaosSync For Outlook. Once installed, this tool will show up on the Accessories menu at the top of our PC software. It can be configured to Overwrite Outlook, to Synchronize with Outlook, or to have Outlook Overwrite Chaos. Whenever you use this tool, it will make the needed and requested changes to keep our data and Outlook's data up-to-date, so when your iOS device connects to iTunes, iTunes gets the data from Outlook (which it in turn, shares with Intellect through this add-on tool).